The first developer to make an EHR exclusively for the iPad is now aiming to be the first choice for physicians and patients looking to make the most of their new Apple Watches. When the Apple Watch first becomes available from select retailers April 24, Mountain View, Calif.-based ambulatory EHR developer drchrono will be ready – just as is it was five years ago, when a newfangled contraption called the iPad first hit stores. At HIMSS15 in Chicago this past week, Daniel Kivatinos, drchrono's co-founder and chief operating officer, demonstrated new software for the Apple Watch that had been in the works for months – since Apple first put out the software development kit for the device. "The moment they release the SDK, we can build a simulator app, even though we don't actually have the physical hardware," said Kivatinos. "We did the same thing with the iPad: When we heard about the iPad in 2010, we downloaded the SDK prior to the actual hardware being released. "The moment the physical hardware came out for the iPad, we released the app in the app store," he added. "Same situation here: The moment the physical hardware comes out, our app will be available." Kivatinos says drchono plans to be among the first to offer an integrated EHR as soon as Apple Watch becomes available. He's excited about the device's potential to transform the office experience for doc early adopters, offering a new twist on real-time communication between physicians and their patients. "We've thought about this a lot: What is our company, what do we do?" said Kivatinos. "Over the past several years we've realized we're creating wearable health records for doctors and patients." With close to 70,000 physicians and more than 4 million patients registered on the drchrono platform, he said, both groups are poised to enjoy the benefits of this unique way of interaction. "This is a completely new experience," he said. "For the first time, doctors are going to have information given to them with their hands free: A doctor could be administering a shot, picking up a child, moving an elderly person – looking at the information while doing whatever it is they need to do." Likewise, said Kivatinos, patients should be drawn to experiencing their personal health records through a device on their wrists, using drchrono's app to schedule appointments, get medication reminders and manage their chronic diseases: "Apple creates a very nice experience for patients. It's not just about usability, it's about enjoyment." The app will enable docs to view a patient information at a glance, respond to messages via quick text and see eRx refill requests – offering a wearable extension of the drchrono iPhone and iPad apps, according to drchrono. "Doctors are incredibly busy; drchrono on Apple Watch gives them insights about their practice and patients just by checking their wrist," said CEO Michael Nusimow in a press statement. "Its simply amazing to have a hands-free way to gather quick insights about a patient." Plenty of other vendors have already readied software for the Apple Watch's release, of course, and many of them were showcasing it at HIMSS15. Epic, Cerner, athenahealth, Vocera, Mayo Clinic and more all announced apps – or plans for apps – at the show. Kivatinos said he's confident drchrono's early leadership among curious early adopters of Apple technology will keep them well-positioned among physician practices. "If you look at the early days in 2010, we put our (iPad) app out the first week and had thousands and thousands of docs download it," he said. "It took some of our competitors years to get to that point." Physicians "want innovation, but they want it to work," said Kivatinos. "We had one doctor who bought a $100,000 EHR, and came to us a week later and said, 'This doesn't work. What do you guys have?' He literally just junked it. If it doesn't work, they're just going to walk away." The critical questions? "Is it usable, is it designed well, can I just put information into it and walk away quickly? Can I just do my rounds? I don't want this thing in my way." 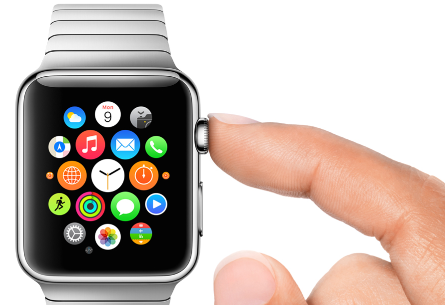 The company touts different "modes" for the Apple Watch app, depending who's using it and how. "Glance" offers a quick view, giving docs a snapshot of their patient schedule for the day. "Short Look Notifications" can display brief messages generated from the EHR app. "Long Look Notifications" offer a doctor a view of the app itself. Kivatinos says he's "100 percent" certain the Apple Watch is going to catch on in a big way among consumers – and his customers.